Having taken a few days to sleep and get back into the rhythm of everyday life (still not quite there yet), I’m feeling ready to look back at the Rabbit Hole experience. For those who don’t know (WHO ARE YOU PEOPLE?!?!?! ), the Rabbit Hole was a three-day writing marathon, in which participants aimed to write 30,000 words each, run as part of the 2012 Emerging Writers’ Festival. With four teams (Brisbane, Melbourne, Hobart and online), plus people playing along from home, we had upwards of 80 people all furiously writing between the 1st and 3rd of June. 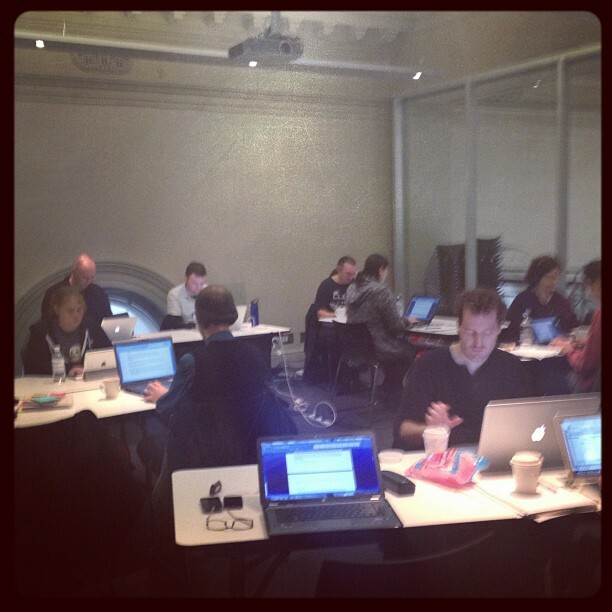 As intern for the Emerging Writers’ Festival, I managed the Melbourne and online teams. For me this meant lots of work prior to the event: finding hosts, writing copy for programs and participant call-outs for blogs, figuring out a budget, organizing venues and websites/groups/emails, finding writers crazy enough to participate (surprisingly, we had waiting lists for both teams as long as my arm! ), organizing milestone marker bonuses and catering. Plus the event was being run in Queensland (the Queensland Writers’ Centre are the creators of the event, the EWF were lucky enough to collaborate on the event) and Tasmania too, so there was a lot of emails between the three states to get everything running smoothly. Enough about my awesome internship which gave me lots of opportunities and responsibilities and skills… Oh, there I go again! Team Melbourne hunkered down with Jason Nahrung, who was well dedicated and not only kept up the banter online and within the room (see: explosions of applause for writers, initiation of #haveapencil, participants showered with chocolate) but he also joined in the writing and had his head down and fingers flying across the keyboard just like the participants. The glow of laptop screens lit up the Wheeler Centre workshop space (apart from Nicola Opt’Hoog, who did the challenge longhand! ), and healthy rivalry between participants meant that everyone chased everyone else’s word-counts as they went up on the whiteboard. Team Melbourne had a cheer squad composed of writers from other teams, states, and people around the EWF who weren’t even participating in the Rabbit Hole. One such writer (Owen Vandenberg, bless his heart) even cooked biscuits, vegan ones, in his home, and dropped them off to help fuel the writing bunnies. (Example Tweet from the moment of realization of said cookies: “Oh my god… there are oreos INSIDE these goddamn choc chip cookies. What kind of magical genius is this??? Who is responsible? #rabbithole”). Too cool. The Melbourne weekend finished with two writers crossing the 30K mark. Even those with word-counts on the lower end of the scale had around 10,000 words – I don’t remember the last time I wrote that much toward any one project. I sat myself next to the snacks desk (it was the only available seat, I swear!) and got to overhear all the great water-cooler conversations about strategy (Pomodoro, biscuits, chapter outlines), and what everyone was working on. Aside from the amazing amounts of work produced, the networking and sharing of creative excitement was what made the event so great. The online team (who called themselves Team Awesome until the 2nd of June, when it was changed to Team Amazeface in light of smashing goals and word-counts) was led by Patrick O’Duffy, whose intense energy and never-ending supply of writing-related lolcatz kept everyone enthusiastic. Events that are run entirely in a digital space are becoming more common – the EWF ran Twitter Fest again this year, which included daily panels on a range of subjects, plus EWF digital was a whole side-festival in itself. I’m part of “The Subcommittee”, an online writers’ group of sorts. I’m getting more and more comfortable with things happening entirely in digital space, but it never gets any less cool. So as you would imagine: Team Awesome/Amazeface was cool for its digital novelty. It was also cool for its bunch of amazing writers, who managed to make some exciting organic stuff happen, similar to the water-cooler sharing in the face-to-face team. In planning an event, there’s only a certain amount of planning you can do, and then the event happens. In its happening, it takes over and… well, it just happens. Without prompting, the online team started sharing their words at regular intervals during the day. They also shared bits of their lives, and so the team-members got to know one another and sympathize with things like cravings for heat packs: one member got one, and then everyone did. I couldn’t plan that kind of closeness. The sharing of work fit nicely into the blog that Patrick and I set up for the online team as a milestone reward for hitting the 20,000 word mark. Hopefully it gives you, dear Reader, a taste of what was being produced over the weekend. Probably the most rewarding thing to come out of the weekend was how many people commented that they’d achieved more than they expected to, or thought they could. People surprised themselves – isn’t that freakin’ awesome?! Mine isn’t the only wrap-up post or reflection on the Rabbit Hole experience, so here are a heap more, if you care to check them out. They’re from Rabbit Hole participants all over the country. Thanks once again to the Queensland Writers’ Centre for letting us in on such an exciting event – writers all over the country got so much out of the weekend, and I had a blast being involved! …And of course, thanks for EWF for having me on board as an intern – I’ve made amazing friends, learned a lot about myself and gained a heap of new skills (making badges! spreadsheets! QR codes!). I’m sure this won’t be my last post about the EWF experience though, so more gushing in later posts. This sounds so much like NaNoWriMo in November. I think you’d really enjoy it. The best bit is the write-ins at people’s houses, or in cafes or pubs, where it’s like a giant LAN party and all these laptops tap-tapping away. The other thing we do is ‘word wars’ where you set a time of around 15 minutes and everyone has to be quiet and write flat-out. I can get around 500 words or more out in that time.